A 25-year-old Buddhist monk of the Katana Sri Wardhanarama Temple passed away after an elephant who went on rampage had attacked the monk during a Perahera in Katana last night. Police said the monk was admitted to the Negombo Hospital and succumbed to his injuries early this morning. The monk, Kulasendawe Rahula Thera who graduated from the Kelaniya University had been teaching at a Pirivena school in Eppawala, Anuradhapura. This is a result of these animals being tortured during their 'training'. These are wild animals and they belong in the jungle, not to be slaves to human beings. 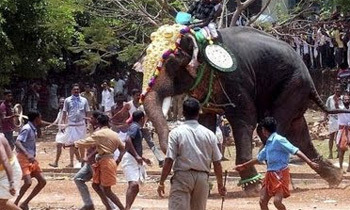 Ban not peraheras, but the use of these beautiful Elephants. They belong in the wild. animals belongs to jungles, let them live peacefully in jungles, , these perahara is belongs to peoples, why we should participate animals, no use. ACTUALLY THESE DAYS THERE IS A HOSTILITY BETWEEN ELEPHANTS AND MONKS. Ban peraheras. They are unbuddhistic and cruel. No different from circuses where animals are tortured. Idiots - 1 idiot, no loss. Looks like we need to get only PAARAMPARIKA Elephants now on. Perehara was initiated to show case beautiful women to the kings, since there is no more kings, why Perehara? I too agree with das. Treating this nobel animal is no difference how circus animal are brutayl tortured to train to obey the handlers commands.